Buddhists name it the law of impermanence. Physicists describe it as simple entropy. Historians see it in the fall of empires. Nothing in the universe lasts. In our technologically-enhanced 21st century, with our exponential inventions and sci-fi aspirations, we assume we have transcended the fate of time. We suppose that we have outgrown the laws of nature and surpassed the end of history. We think we have stabilised into ‘modernity,’ an age filled with promise and progress, and that science will continue to carve the path ahead, solving in its wake the seemingly insurmountable problems it created with yet more exquisite, shiny solutions. This techno-optimism is understandable, but ignores fundamental truths about the nature of reality. That things arise, then they pass, and history follows this pattern of pulsation. At the end of 2017, in response to the chaotic political events of the last 2 years coupled with my general interest in systems change, I began dedicating time to researching how and why societies fail. What started as intellectual curiosity became a 6 month free-fall into the deepest of fascinating rabbit holes. This article is an attempt to centralise some of the key issues surrounding systems demise, and demonstrate that there are remarkable consistencies between our current predicament and failed civilizations of the past. Of course, this may sound like the opening gambit to an evangelical prophecy of apocalypse. Humans have predicted ‘the end of the world’ for millennia, and alas, we’re still alive and kicking. I do not proclaim clairvoyance, or crystal ball ownership, or divinely inspired dreams (though I did once get a Fortune Cookie on a boys’ holiday that said the end is nigh, so there’s that…) Instead, the below article is a combination of systems-thinking, pattern recognition, my background in economics and wisdom from ancient traditions. That voice is still there. Is this grandiosity writ large? Some form of deep narcissism manifesting as a saviour complex? Quite possibly. But in all honesty, I would have actually found this piece harder not to write than to write. It’s kind of heavy sitting on all of these potential scenarios and not articulating them. So worst case scenario, this is a public journaling exercise. What you are about to read is not some far-Left assault on capitalism and the evils of Western oppressive systems. Indeed, a lot of people who protest against the system are often screaming against structures in which they’ve had no luck or no breaks, or have been institutionally discriminated against. I’ve had the opposite. In fact, our current system suits me and my lifestyle really, really well. I’ve lived a life almost archetypal of a system ‘success’ — private schooling, an Oxford degree, family wealth, an investment banking job (on top of being a white dude). And so to this critique I bring a decent amount of knowledge of the way things work from the inside, as well as relative success within the parameters of said system. Moreover, I’m not in the camp of complaining about our evolutionary journey thus far. Capitalism has taken most of the world out of abject poverty. We have benefited in many ways from all of these systems and facets of society that so many progressive thinkers condemn. But now they are coming to an end, so more complex and life-sustaining systems can take their place. The Left get it wrong by suggesting all of the world’s ills will be solved by doing away with all of our current, ‘oppressive’ systems. The Right get it wrong by assuming our current systems are the best we can do. Neither are correct. We must transcend the dominant structures yet include the properties that are worth keeping. I also want to make something clear. Although this piece points towards an inevitable large-scale systems collapse, I do not find myself speaking from a place of existential fear and doom. Well, I do, but this is blended with feelings of wonder, hope and all-round fascination with what comes next. The laws of the cosmos, every single facet of the universe and life itself, is grounded in a fascinating dance between order and chaos. Self-organising systems from galaxies to organic life itself have an unquestionable drive towards complexity. And what we have learnt is that in this process, the old must die for the new to be born. Creativity and destruction are two sides of the same coin. It is in this friction, this battle between order and chaos, where we get greater novelty, higher level system organisation, and frankly, more beauty. Can we celebrate the paradox of this marriage of tragedy and beauty? The evolution of living systems is inextricably embedded within a cosmological process of birth and death, of order and destruction. We cannot escape this. We must learn to dance with this fact of life, and acknowledge both the tragedy and the beauty of a universe underpinned by these forces of duality. To deny the tragedy is to stick one’s head in the sand and pretend you are not part of the cosmic unfolding, and forget the fact that every single right and piece of land that we benefit from today is based on bloodshed, suffering and catastrophe. And similarly, to ignore the beauty is to deny that we can reflect on love and goodness, and experience joy and ecstasy and connection and wonder. Zooming out, we see that in the universe’s innate drive towards novelty, these cycles of boom and bust are foundational. They cannot be escaped. For new sandcastles to be built, the old ones must be destroyed. And that process is itself a paradoxical blend of wonderful despair. One of my Professors, the mathematical cosmologist Brian Swimme, in his book Journey of the Universe, illustrates this tension with the evolutionary battle between a predator, the hawk and, its prey, the lizard. The hawk adapts its biological capacities over time to ensure its survival, while the lizard does so within its own evolutionary process. The hawk develops a larger wingspan, better eyesight, greater speed, and in doing so increases the likelihood of its species’ survival. The lizard better camouflages itself through colour, increases its darting abilities and starts to inhabit denser forest areas. This is a co-creative process, a circle of cause and effect where no animal is leading but rather participating mutually in this dance of survival. And it is exactly this drama of life and death that gives rise to more complex life forms. More beauty. More novelty. Destruction births creation, which births further destruction. So I want to make people aware of the likelihood of systems collapse, but also empowered to dance in its destruction. To become islands of sanity, not columns of despair, in the midst of this great Mystery. And to know that consciousness evolves in peculiar yet somewhat predictable patterns, and we are bearing witness to a remarkable period in its transformation. We live in a remarkable and finely balanced ecosystem. We take for granted the miraculous processes that allow us to drink, to breathe, to eat, to live. We are embedded in interdependent relationships with all of life itself: from trees and plants to oceans and corals, from mycelium and glaciers to bees and plankton. Our ignorance of this interconnectivity has come at a significant cost to the only true Home we have. In our Western bubbles of comfort, it can be difficult to fully internalise what is going on with regards to the environment, in large part due to the nature of ecosystem change. It is slow, it is steady, it seems to be ‘elsewhere’, and thus does not have the shock factor of a more immediate crisis, which is often what is needed to draw the masses into action. The danger is that such is the sensitivity of our ecosystem, all that is needed is for one part to collapse to lead to a domino effect on the whole. For example, as plankton die off as oceans continue to acidify and warm, we lose the organism that provides 50% of the oxygen we breathe. Similarly with bees: as their levels go lower and lower we lose out on the principle pollinators of 70% of our crops, leading to food crises. And cascade effects are already beginning. In Syria, for example, it has been suggested that droughts were the initial catalyst for civil unrest, as they forced rural farmers into cities, putting excess pressure on local resources, thus leading to resource wars that tippled over on a national level. Same goes for the general European refugee crisis — these people are coming in hoards now because droughts are destroying livelihoods at home. Meanwhile, exponential technologies are ushering us into an age of existential risk. Previously, the only technology that had such vast implications was nuclear weapons. Now, with forthcoming artificial general intelligence, cyberterrorism and synthetic biology, we are building tools that have the potential to destroy humanity should they be misused, either deliberately or accidentally. Until the 1940s, warfare was never existentially threatening. Wars could be fought in every corner of the world and yet never was the survival of the entire human species at stake. Yes, plenty had the potential to die, but humanity itself would survive. We are about to enter an age in which such technological threats are magnified significantly. In the not so distant future, students in a chemistry lab could hypothetically access the capacity to create inventions with global implications. And as Daniel Schmachtenberger points out, we are exponentially increasing our ability to impact the world without proportionally improving our ability to make good decisions. Granted, technology-driven apocalypse is no guarantee, and these are also the very tools that could save us. In fact, they might paradoxically be the only tools that can save us. But which way they go is completely uncertain, and this is a major, major problem. (Note, I consider myself a techno-realist — I’m not a sceptic as I recognise technology’s capacity for scalable, beneficial change, and I work with an organisation that is at the leading edge of this, Consciousness Hacking. Yet at the same time, the thinking that we can just invent our way out of problems that we created is an approach that cannot go on forever). We are in the midst of an illusion of progress. We think that because we have built these fancy inventions, we have stepped out of time. We have been seduced by the narratives spun and machines built by our logical minds, all the while forgetting that our level of consciousness and wisdom has not been increasing at nearly as fast a rate as technology has. These are the obvious risk factors, and they’re receiving ample attention from scientists, politicians, entrepreneurs and thought leaders. Perhaps not sufficient, but a substantial amount. Added to these dangers are the threats of tribalism and populism, which will only hasten societal collapse. For this article, I will not be addressing these trends, though the are extremely important variables in the debate. Over the last 6 months, I’ve discovered that there is substantial archeological and historical research that gives us clear indications of previous civilization collapses — when they happened, why they happened, and how often they tend to occur. In our 21st century hubris, we think we have transcended this road of ascend and collapse, as we assume we have the technological knowhow to circumvent the types of issues that blighted those poor bastards that came before us. Below I give a brief insight into several key scholars in the space, each with their own take on why systems fail. Eerily, you’ll see that each author illustrates some clear trends that are embodied very clearly in our current predicament. If you’d like to read more on them, see the references at the end of the article. Before diving in, I want to flag that I do not bring to this discussion an equal level of discernment as better-known systems theorists in the space, namely Margaret Wheatley, Daniel Schmachtenberger and Jordan Greenhall. My inquiry began at the end of 2017, so I yield to those who have been sitting on systems-shift ideas for decades. I have been strongly influenced by these thinkers, so for those familiar with them, expect to see thematic similarities. If there are reference omissions, please let me know. Civilizations collapse when their institutional and societal structures fail to account for increasing complexity. Dr Joseph Tainter is an American anthropologist and historian. His book, the Collapse of Complex Societies (1988), uses a combination of network theory, microeconomics and complexity theory to show how societies evolve layers of complexity as they try to solve problems. When a problem emerges within a civilization, bureaucracy and administrative infrastructure amplify to address the issue, becoming more and more complex until an inflection point whereby institutions collapse under their own complexity. Tainter highlights 17 rapid collapse societies — from The Harappan Civilization in India to the Roman Empire — and epitomises their downfall as follows: “Collapse is fundamentally a sudden, pronounced loss of sociopolitical complexity.” Tainter’s account is largely based on economic s— declining marginal returns as a consequence of higher complexity. Tainter suggests collapse is merely an economising process when a society is required to restore the marginal return of investment to a more feasible level. In other words, collapse occurs when the marginal benefit of extra complexity is lower than the marginal cost (diminishing returns at work), and thus regression to less complex systemic dynamics is the better alternative than adding more rungs of complexity. That said, modern societies may not have this option, since they are being propped up by external countries in a globalised system. For Tainter, the ultimate cause of civilization failure is a society’s inability to handle complexity. Complexity alone however is not sufficient to cause collapse. If complexity is increasing but our ability to handle it is too, then there’s no issue. So long as a system evolves its competencies in conjunction with its complexity, and makes sense of its multitude of nodes and layers, all is well. The problem is, in the modern world, our competence abilities are dwindling. Think about our current predicament in graphical terms. Complexity is increasing at an exponential rate yet our ability to understand said complexity is, at very best, marginally linear and of positive gradience (though most likely at a negative one). Let’s say you are playing a video game in which you are a first-person shooter, and you have to proceed throughout the levels. Level 1 consists of you playing in a single virtual room and needing to kill 1 militant. Easy. Level 2 has you play in a limited battlefield with tactical support, and you have to kill 10 militants together. A little bit harder. Level 3 places you in a huge battlefield, on your own, and you have to kill 100 militants. Harder. Level 4, 1000 militants. Level 5, 10,000 militants. You get the gist. The level of complexity in the world is increasing, moving to higher difficulty levels at a faster rate than it ever has before due to changes in ecosystem conditions and exponential technology. Yet we still only have the capacity to train at the normal level we are accustomed to. The game difficulty is at level 20, yet we have only had the time to practice up to level 5 (and in many ways are actually moving to previous levels in terms of competency). Our inexorable drive towards ‘progress’ and innovation has resulted in a world that is more complex than any of us have the capacity to understand. Technology accelerates at an increasing rate, and so by the time we have the ability to decipher how one lever manifests in the entirety of a system, we have already created a new innovation with different implications. Similarly, we cannot understand how rising CO2 will affect each part of the ecosystem because there are simply too many facets to comprehend. The increasing rate of technological advancement means said complexity will continue to diverge from gains in competence. Added to this is the institutional complexity that Tainter speaks of and you start to see how out of control complexity is becoming. But why can’t our competence levels keep up? We are, and we inhabit, living systems. A living system is an open system. Its boundaries are porous, it has sense-making competencies. It exchanges information with its surrounding environment, adapting itself to changing conditions in order to survive. Information is to a living system what blood is to the body. It flows through its veins. It provides the ingredients to allow life to organise itself. It is the source of all growth and development. In short, information keeps a system alive. Lo and behold, information in the modern world is broken. Blood poisoning. We, as individual and collective living systems, have lost our ability to make sense of our environment because the information we are receiving, and the way in which we are processing it, is dysfunctional. And any living system that fails to make sense of its surroundings is destined to fail. Period. Our ability to make sense of information has been decimated by the rise of technology. Our levels of distraction are now so severe that symptoms that were hitherto related to mental health conditions — memory loss, distractibility, concentration issues — are just part of the new norm. We are perpetually plugged into distractive technologies that exploit fundamental psychological fallacies in humans, creating dopamine feedback loops that keep us coming back for more. Consequently, our ability to discern good and bad in our environments, to tune into the information that is healthy for us, is severely compromised, and instead we are in engaged in an Orwellian attention war between Facebook, Apple, YouTube et al. Technology has mitigated our capacity to sense-make, and thus reduced our ability to grow in competence with complexity. Instead, we turn our attention to Candy Crush. How can we expect to live in a healthy system whose inhabitants are completely relegated to a domain of reality that is so far removed from what is actually going on? Our sense-making frameworks have been contaminated by distraction. Hitherto, factual information was factual information. Information exchange was communication between people. Now, factual information is seen as contextual, fake, untrustworthy, while information exchange is virtual and instantaneous. The quality of our information has decreased. In a world of universal access, our communication channels via social media open us up to a deluge of information of authenticity we cannot verify. Indeed, even if we do verify it post-hoc, we have often internalised the initial message and thus reject its ‘correct’ premise, especially if the latter conflicts with an already existent belief system. Moreover, as we scroll through Facebook, and Instagram, and BBC news, we are flooded with information. We thus quickly become desensitised to some information, whilst selectively choosing the type of information we want to see, rather than what we need to see. With this juxtaposition of desensitisation and selection bias, our sense-making become severely compromised. Furthermore, we are living in a world in which propaganda has more platforms to spread itself than it ever has before. We are bearing witness to viral lies and strategies by politicians and leaders, techniques once assumed to exist solely in the domain of marketers and advertisers. This information, or disinformation, is being used to deliberately mislead and misrepresent. Added to this is the speed and intensity of internet dissemination, which has been shown to change the way content is perceived, and thus alter one’s emotional response (try reading information on the web versus a magazine, or better still, a book). Our temporal frame of reference through the internet draws us into immediacy, reactivity, and away from a careful contemplation of the facts. “In people’s confusion about what is real, what is bias, what is fact, what is misinformation, combined with their indifference to discern one from another, it becomes easier to label everything as bogus, false, rigged. It takes effort to discern what’s really going on — it’s easier to be cynical. This attitude is alarmingly evident among younger people who grew up in the Internet age and have no other frame of reference or experience in assessing the validity of information. People feel free to dismiss any scientific research as bias, mere opinion like everything else. Once labeled as opinion, people feel free to dismiss it if it conflicts with their already formed personal views.” (Wheatley, 2017). Social media has delegitimised information, as we have no way to discern between what is real and what is fake. This means we are embedded in a living system that is trying to make sense of its environment yet cannot ‘trust’ its sense-making capacities, because so much of the information trying to permeate through into the system is bogus. This leads to the system forgoing vital, true information that is beneficial, or indeed necessary, for its own survival (think climate change denial). As Daniel Schmachtenberger highlights, we have reduced information coherency in our system yet our ability to act on the back of our information is increasing exponentially. In other words, we are, in relative terms, regressing from adults to children, yet instead of being given toy guns and cars, we are creating robot armies and artificial general intelligence. This is an existential problem. Not only is our living system failing under its own information incoherence, it is creating tools that amplify massively the probability that such incoherence leads to the demise of the system. Sir John Glubb spent his career studying 13 empires, from Assyria in 860 BCE to the United Kingdom in 1950. His last publication, The Fate of Empires (1976) documents the almost identical patterns of ascension and collapse, irrespective of their technological know-how or environmental conditions. Each civilization came and went in around 10 generations, and each exhibited characteristics at the time of collapse that were nearly identical to that which we are witnessing in today’s society. Glubb categorises the different cycles of an empire, from The Age of Pioneers through The Age of Conquests, Commerce, Affluence and Intellect respectively, ending at the Age of Decadence. Courageous invaders surprise the hegemonic powers, using skills of enterprise and improvisation to defeat the structures that hold up the regime. The existing structure’s boundedness to order is no match for their successors’ ability to think outside the box (chaos), and a new culture is born based on collective purpose and honour. The civilization grows, and internally there is much cohesion, usually around a shared religious belief. It transcends and includes the military prowess of its predecessors and seeks to grow outwardly, conquering lands and people in its wake. Honour and integrity are central values. As new lands are navigated and different cultures subsumed, the civilization, propped up by its military prowess, redirects its aspirations towards wealth, though courage and truth are still high priorities. Trade is encouraged and money replaces honour as that which those at the top aspire towards, allowing certain classes to grow extremely rich. Beauty becomes a key value, art and architecture rise in importance and thorough network channels are established. Great promises are held for the future, and there is national pride and entrepreneurial daringness. Money takes centre stage and courage and truth begin to decline. Wealth replaces honour, and individualistic endeavours are prioritised over what is right for the collective. The voice of duty is silenced. Ambition is for money, and defensiveness sets in on a personal and societal level as the civilization tries to protect the vast arrays of wealth it has built. The arts begin to decline and public action is replaced with public discussion. The belief becomes that civil improvements should arise from the faculties of mind over action. Internal factions begin to rise up, and those in power engage in extra layers of propaganda to mask divisions and create external enemies. Materialism is the dominant value system, and nihilism and narcissism set in. A celebrity culture takes over, and that which is aspired towards is centred on fame and spotlight. The public are distracted and circumvent moral duties and values. Impenetrable hubris sets in at the top of the hierarchy, and it is assumed that history has ended. Welfare increases substantially, but this seemingly benevolent strategy falls away when money begins to run out. Society begins to fail. This was written almost 50 years ago, and emphasises the centration of celebrity as a symbol of the age of decadence. Lo and behold, the most powerful position in the world is now occupied not by a man of honour, or integrity, or truth, or courage, but a reality TV star. Even Aristotle and Plato predicted that since democracies are inherently unstable, tyranny eventually arises and we make a commitment to a person not principle. Cults form around celebrity around the time democracy is moving away from equilibrium. We are in the deep throes of a capitalist culture that has programmed us to believe our value to be intertwined with the material we possess, that the purpose of life is to buy more stuff and then earn more money so we can buy more stuff. This narrative is so engrained in us that we don’t even question its validity. It’s just the way it is. As materialism has risen to the top of our value hierarchy, it has displaced the virtues that allowed us to become a civilization in the first place. Truth is the major one. A system is a healthy system when the information that is disseminating within it is accurate (i.e. truthful) information. In a living organism, anything that disrupts the flow of truthful information is essentially parasitical. It is a virus. We cannot effectively navigate our environment when we cannot trust the information being delivered. But we live in a macro world of fake news and meme propaganda, and a micro world of normalised lies and deceit in relationship. Now, how could this happen? Well firstly, I think it’s important to understand that a macrocosm is an expression of its microcosms. Put differently, society is a collection of interpersonal relationships at scale. We have become so disconnected from truth and honour in our personal lives that we implicitly condone their violation in the political sphere. We don’t really get pissed off at Trump’s or Johnson’s lies, because we ourselves are engaging in similar levels of deceit almost daily. A white-lie here, a half-truth there. Second, in a world in which the ideology of postmodernism rules the day, which says that all truth is contextual and relative, truth has lost its ground as an absolute. I can attest to being apart of this issue. Until a few years ago, I simply did not value truth highly. I valued self-preservation (or at least, my perception of it). I lied to girls about being faithful, I told white lies to friends to avoid conflict (“oh, I have plans tonight, sorry”), and most significantly, I avoided my own truth out of people-pleasing and fear of judgment. And I think the only reason I got away with it for so long was that everyone around me was playing the same game. Alas, we have lost our connection to truth. And when a society loses truth, it loses trust. And without trust, no group, big or small, can function. This is what happens in the Age of Decadence, and we are right in the midst of it. But Joshua, I hear you say, things have never been better! Have you not read Steven Pinker’s book? Have you not listened to Peter Diamandis? Have you not seen how many people are out of poverty, how life expectancy is increasing, how violence is plummeting? This is the illusion of Golden times. In peak times, Demarest explains, leaders rarely focus on necessary structural changes and instead seek to perpetuate a status quo that seems to be working on the surface level. In our current democracy, where political incentives are aligned with short cycles of time, decision-making is at best medium-term and more commonly, completely myopic. We live with short-term evaluation perspectives, all the way from politics to commerce. What is your 1 year plan? What are our quarterly earnings? Are you better off than you were 4 years ago? What can we buy now. Consequently, political decision making during wealth peaks is skewed towards business-as-usual perpetuation. Why change when things are going ‘so well’? People have never been wealthier or safer. And paradoxically, this is exactly the danger Demarest and others point out. 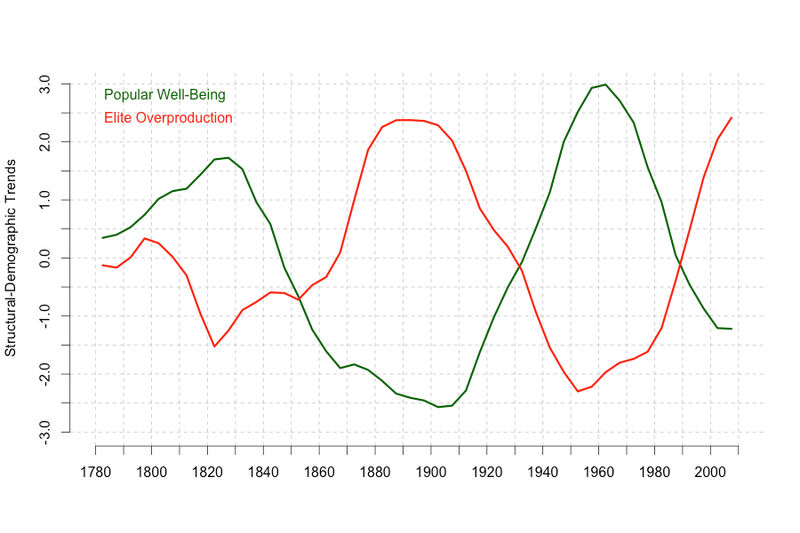 Because history and modern data suggest that wealth peaks precede resource peaks. 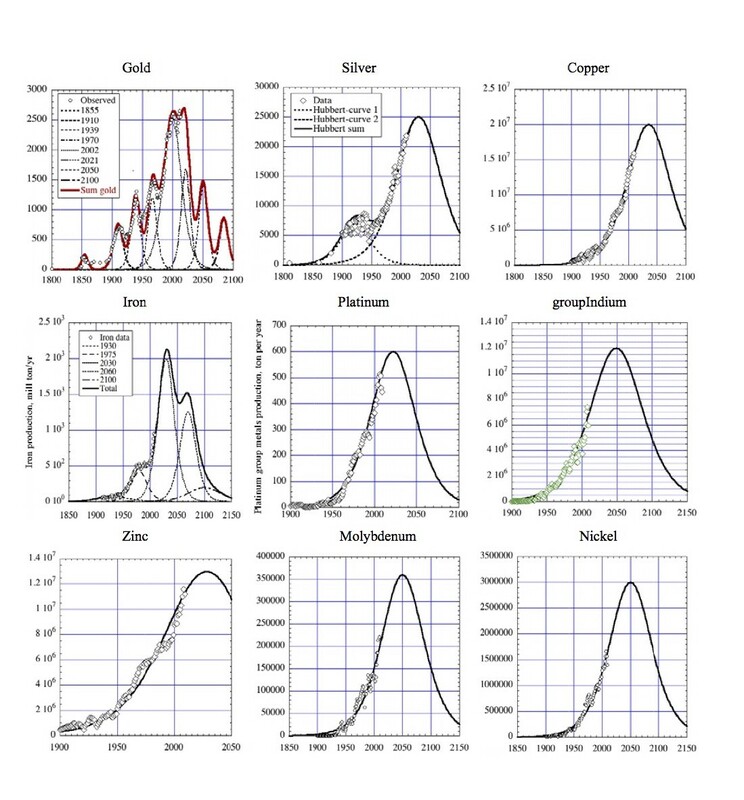 Sverdrup et al (2013) show that strategic metals, elements and energy resources are on the verge of running into scarcity should our current paradigm continue as is. We are in the midst of a peak production rate, whereby “resource production goes through a maximum and then production declines to insignificance over time as the reservoir is depleted.” The fact that we in the Golden Age is itself the problem — we are producing and consuming in quantities using non-renewable resources that are being insufficiently recycled such that we are nearing the end of their life cycles. And this isn’t going anywhere — our entire economic system is predicated on an assumption of infinite economic growth in a world of finite resources. We are in the land of prosperity, but at what cost? The pinnacle precedes the fall. Peter Turchin, Professor of Mathematics and Ecology at the University of Connecticut, is the father of the field Cliodynamics, otherwise known as scientific history. His work illustrates the remarkable statistical consistency of historical oscillations, from century-long periods of population growth and subsequent societal decline, to state-led expansion followed by social and political instability. The key to his work is this: there are empirical trends to history, and we are mere parts of another historical pattern. The indicator used is a combined indicator Turchin calls demographic-structural pressure, which looks at the correlation between population wellbeing and elite overproduction (which includes factors such as top wealth holders, cost of elite universities etc). The higher the level of demographic-structural pressure, the higher the probability of political violence and potential for war. And never before have we born witness to such high pressure. The authors demonstrate that times of demographic expansion are accompanied by growth of elite incomes and inequality (as population growth leads to an increase in rents and a decrease in real wages). More elites compete over financial surplus, putting fiscal pressure on the state, which is historically meant to extract surplus and redistribute. This cycle led to political crises in medieval England, France, Russia and ancient Rome. For example, the Hundred Years War in France, the Hussite Wars in the German Empire and Wars of the Roses in England were all preceded by rapid population growth in the 13th century in Western Europe, while political crises and revolutions in Western Europe, Tokugawa Japan, Persia and the Soviet Union were all preceded by an excess supply of young people with an advanced education (note Turchin has neat rationalisations for both). Of course, selection bias could be at play here, and I’ve not had ample time to dig into his methodology, but he is a statistician so I think it’s relatively safe to assume he has accounted for this. With a causal feedback loop between all the factors at play. There are a growing number of propositions that hold similar empirical merit. See for example the recent work by McConnell et al (2018) that correlates European lead emissions with plagues, war and imperial expansion. Each one of these factors is in full force in our current civilization. We have accelerating complexity with diminishing competence, a materialistic, narcissistic value system, we have never been wealthier or safer, and elite overproduction is at an all time high. If history is anything to go by, we are on the verge of a civilization-level collapse. So what can we do on a systemic level? I have spoken to the weaponised information system we live in, and the propaganda that is becoming normalised as par for the course. Yet we cannot change this. In fact, weaponised information is actually impossible to overcome in our current systems. It cannot be any other way. In a capitalist system of win-lose, and in an economy that values knowledge over everything, companies and competitors are engaged in a constant battle to win, and keep hold of, the best information. Firms are incentivised to come up with information that will give them a competitive advantage, and ensure that no one else in said system takes that. If the heart kept information from the brain, how do you think the body would do? Our bodies survive because our organs are in perpetual information exchange with one another. Yet our economic system, which filters into every aspect of life, is structured such that its agents are actually incentivised to do the opposite. Similarly with research. Scholars we read in academic journals, who are ostensibly leading our collective sense-making capacities, have careers. A career pays for the family. Thus, an academic is incentivised through the nature of our economic system to pursue lines of information that have the probability of getting them paid well. A line of inquiry that could lead to better information (and thus a knowledge system more competent with complexity) will not (or, rarely) be pursued if there is a more appealing financial alternative. This is no blame on the individuals. This outcome is an inevitability of a system that is structurally flawed and completely misaligned with the good of our species. And so disinformation and misinformation are ineluctable consequences of our economics. Why have we created distractive technology, and why is information being weaponised, hoarded, and distorted? In a word, it’s economics. As with the example about the academic above, there is a misalignment of incentives throughout society. Pharmaceutical companies do not want to heal you, or prevent you from getting disease. The military do not want to avoid war. The police force do not want to solve crime. Every industry that is structured on financial returns, which is every single industry in a capitalist system, does not want to completely solve the problems it claims it desires to. It cannot. It survives and thrives within the parameters of a capitalist monetary system that puts profit and shareholder value above all other aspirations. This is not conspiratorial. This is economics 101. It is uncontroversial to state that the major driver of climate change and extinction events is due to fossil fuel production. In our modern industrial consciousness, we have reductively assumed short-term economic growth to be the best driver of human progress (indeed, our current system cannot actually survive without economic growth) and thus engaged in extractive economics for the last century and a half. Our economy is structurally tilted towards the short term, those already in possession of capital (i.e. power) and ingeniously yet tragically removes the players that do not play by its rules. What we have in the world is mass incentive misalignment. We will always have war when the military-industrial complex thrives on its economics. We will always have disease when health companies profit from illness reduction rather than cure or prevention. It cannot be any other way unless we fundamentally restructure our economic system away from growth and profit and towards the benefit of the whole. And this starts by rethinking what we value. As Schmachtenberger articulates in this podcast, we have attempted to homogenize everything into a single value system — money. Take trees. We remove all the context surrounding a group of trees and convert them into materials that can be sold for capital. This does not seem so bad initially, but as more and more actors get involved, entire ecosystems of trees are destroyed. We take complex value and turn it into simple value so that we can make more money, because money is how we value everything. We have been selling off our lungs so we can wear golden watches. And now we’re struggling to breathe. Note: if you’re interested in reading about how our economic system works, see my article here. So we see how our economic system is a major factor in potential systems collapse. It encourages disinformation, it inhibits the flow of good information, and it incentivises actions that are in direct conflict with the long-term health of our planet. But there is another more visceral economic variable that could lead to systems collapse, and is indeed showing all the signs that it might. Income inequality is the relative unequal distribution of income throughout an economy. In developed countries, income inequality is at its highest level that it has been. In the US, for example, in 2012, the top 10% earned 50% of all income and the top 1% took 20%, the highest level in 100 years. This will only increase as exponential technology leads to winner-takes-all economics. Mounds of evidence has shown that a society’s wellbeing is no longer positively correlated with absolute income and economic growth. These factors are still important in developing economies, but not in developed ones. What matters now is the differential between people within a country. Why so? We are social animals. We compare and contrast where we are vis-a-vis others in the tribe to give us a better sense of our own worth. Feelings of value, respect, empowerment and self-worth are rarely felt in isolation, but rather as psychological responses to feedback from our social environments. Indeed, threats to social status and self-esteem are shown to induce some of the highest stress responses in humans. We live in a society in which social stratification is based primarily on income/wealth, and so the greater the gap between layers of income, the greater the psychosocial effect on those on the lower rungs. As a result, we see the occurrence of phenomena such as aspiration gaps (where those far ahead on the ladder become too out of reach to those on the bottom and so demotivation to climb sets in) and empathy gaps (where those on the top feel so different to those on the bottom that they struggle to connect to their level of humanity). Globalisation has redistributed wealth away from developed countries like the US, predominantly at the expense of lower income workers (because most jobs that are now outsourced replace low-skill and thus low-wage jobs). This is a core reason for the emergence of Trump. He spoke to low-to-middle wage workers who have been feeling the economic and social effects of globalisation, and thus income inequality. Liberals and Democrats were heralding this incredible uptick in the fortune of the nation, which was true on an absolute level, but not on a relative one. And it is this relative differential that is the most important driver of social cohesion. So income inequality is one of the best predictors of the overall health of a system. The more unequal a system is, the more likely those who are losing out will start to rebel. Trust is lost, polarisation manifests, and people start looking for easy targets of blame. And justification for their felt sense of inequity. Lo and behold, those in power spin narratives that deflect attention from them and toward groups without as strong a collective voice. Back in the 30s, that was the Jews. Now it’s immigrants (Eastern European scapegoats for Brexit, Mexican scapegoats for Trump). This is the seed of civil unrest. An unequal system is one that is out-of balance. It is not in homeostasis. Interestingly enough, David Moss from Harvard has shown that income inequality, in addition to disintegrating social cohesion, also contributes directly to financial crises. Inequality centralises power in the hands of those atop the financial system, and in a world in which corporate interests and government policy are intertwined, said players are able to encourage policies, such as deregulation, that benefit their industries/firms whilst compromising the integrity of the system in general (note that Trump is now beginning to deregulate the financial industry again). Meanwhile, those at the bottom of the ladder are driven toward financial decisions, such as mortgages they cannot afford, that also jeopardise the system. Speaking of financial crisis. The 2008 crisis was ostensibly ‘solved’ by drastic monetary measures taken by central banks and bailouts by governments around the world. Quantitive easing, where banks printed money from nothing and bought vast amounts of government bonds, coupled with near zero interest rates, were sufficient intervention mechanisms to stop the system from collapsing (though whether it was the intervention per se that ‘saved’ institutions or merely our confidence-inducing signalling response in them could be debated). It’s always quite hilarious to read commentators’ perspectives preceding market crashes. The narrative pretty much always goes: “this isn’t a bubble [INSERT ARBITRARY JUSTIFICATION].” People who predict crashes are dismissed as loonies, naysayers and the types of people you really don’t want to have at your dinner party. Then the crash happens, because business cycles themselves are natural cycles and thus also exhibit boom and bust and order and chaos. And then those who were previously on the periphery are taken to be gospels of prophetic truth, and become the next generation of economic thought leaders (Note to self and others looking to play a safe meta-bet: predicting economic collapse is a dominant game theory strategy for finance-related career progression, so long as you’re not specific about timing. Things always collapse, and yet most people side with consensus, which is by definition anti/in-denial-of systems crisis because those perpetuating the dominant, ‘everything is okay’ narrative are incentivised to keep the current game going for as long as possible. And so you create a unique peripheral niche which will undoubtedly become more mainstream, and that’s essentially what a winning marker strategy is). We are now in a situation, 10 years later, and we have all of this extra money in the system. Economics 101 shows that an increase in the money supply usually has inflationary consequences. This has not been an issue for the last decade, as there has been ‘excess capacity’ in the system, which provides a buffer in which we can increase output without a correspondent rise in prices. That is, more money in an economy usually makes prices go up if, and only if, said economy is operating at full strength. The world is back to experiencing strong levels of growth, including wage growth, and these tend to be drivers of in inflation. Now, it is becoming increasingly likely that interest rates might have to go up fast in order to offset this potential surge in inflation (which, given that interest rates have been near zero for a decade, is somewhat inevitable). It doesn’t take an economist to see that there is something extremely fragile about this. Stocks are at an all time high, interest rates are at all an time low (note, this has never happened before, as these variables are theoretically inversely correlated) and there are some extremely similar patterns now compared to our last crash. 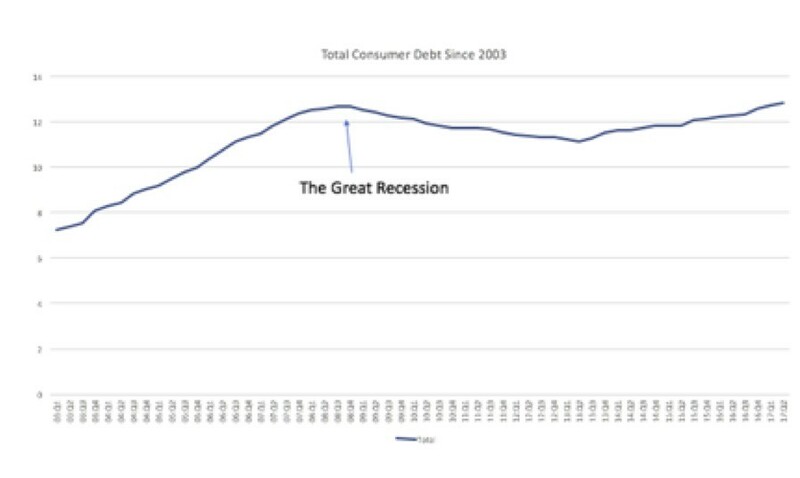 Consumer debt is growing — total consumer debt reached a record $13.15 trillion last year in the US. The prior peak was $12.7 trillion in 2008. The assumption has been that since consumers are not piling up mortgage-based debt a la 2008, they are somehow deleveraging. This is quite simply not true. Debt has been redistributed away from housing and towards other consumption outgoings, and is just as runaway as the rest. But Joshua, banks have been forced to comply with extra capital requirements, and almost all of them have passed their stress tests to date. Surely we’ve made the financial system more secure since last time? Yes and no. In many ways what we have done is build a protection wall to the South having been attacked by an enemy from that direction before. But of course, once an enemy has attacked from one direction and been shut out, it will try another way. Same with crises — we respond with measures ex post but rarely if ever do we see the same crisis in the same form. It comes in different shapes and sizes. The scale of the global financial system has increased significantly since 2008, with bigger banks, higher asset concentration in fewer institutions and $70 trillion of new debt. Yes, banks have higher levels of capital to protect against shocks, but there are several other economic pitfalls that could arise irrespective of banking capital buffers. 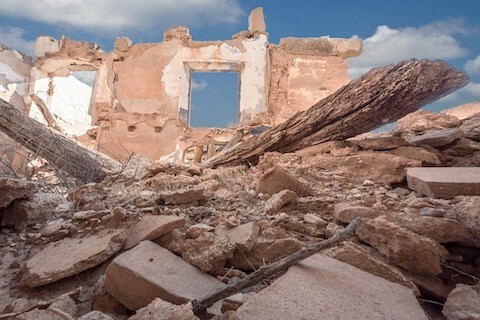 War, climate change and other financial institutions not covered by stress tests are just some of the factors that could catalyse a system meltdown. What’s more, there is actually now talk about deregulation. Trump is scaling back Dodd Frank, the rules and regulations that were put in place to keep the economy stable. This is what happens in Secular Cycles, as noted by Turchin: there is the misguided assumption that since all is sailing along plainly in the economy, we can afford to rid ourselves of inefficient bureaucracy. And it is in this shedding of risk-averting regulatory layers of skin that contributes to the next round of frivolous financial speculation and risk-taking. Let’s say another shock does indeed hit the system, what are our potential responses? Central bank balance sheets are so inflated that further rounds of quantitive easing would be almost impossible to foresee, while interest rates are already at essentially their zero bound (granted, rates could go negative, but this gives rise to even further problems). Since governments are still trying to fiscally rebalance after the last crisis, and have set strict stress test capital requirements for banks, large bailouts of bank institutions are highly unlikely. James Rickards, a respected economist and author of Road To Ruin, suggests that banks will freeze consumer assets when the next crisis hits. That’s right. We’ll not actually be able to take our own money out of financial institutions. This is the road to anarchy. In short: given the current state of fiscal and monetary policy, governments are impotent to act in ways they could before. Meanwhile, interest rates, stock prices and excess money supply are in unchartered relational (and absolute) territory, whilst income inequality is reaching unprecedented peaks. We need economic stability to maximise the probability that technologies like biotech and AI are used responsibly. The more stable an economy, the more stable the fabric of society (bear in mind Hitler came to power as a direct consequence of economic hardship in the 30s). But we’re in a catch 22, in which we need our extractive system to go, it’s about to go, and yet this very demise increases the likelihood of technology being used malevolently. There comes a time when all life on Earth is in danger. Great barbarian powers have arisen. Weapons of unfathomable destructive power, and technologies that lay waste our world. The kingdom of Shambhala emerges. This Tibetan prophecy from the 12th century was relayed to the systems thinker and deep ecologist, Joanna Macy, who I recently spent a weekend learning with. The kingdom of Shambhala, be it mythic or literal, refers to a period of time when a certain warrior will rise up and harness two core weapons: compassion and insight. Tibetan culture thinks now is the time for this emergence. How do we cultivate our inner Shambhala Warriors? How do we show up, in the face of destruction, with insight and compassion? This is the ultimate call to action, to leadership. We, as individuals, cannot control the outcome of our current system, but we can control how we show up in response to its demise. We can work on ways of being that build inner resilience, greater community, and mental readiness for what may come. And any utopian optimist who thinks we can make a smooth transition toward different systems without war and mass casualties fails to account for the layer that lies ready to pounce beneath our rational, modern minds — the id of history, the savage barbarian we deny that lurks in the shadow of psyche. The complexity curve has unstoppable momentum. It is exponential. Yet our level of consciousness/competence/wisdom is not keeping pace — it’s flat-lined, or perhaps has a negative gradient. The further these two curves decouple, the higher the probability of systems demise, because we can’t make sense of the complexity curve. Therefore we must somehow hack the competence curve. It is now an existential necessity that we evolve a higher-order form of intelligence to navigate through these times, and my sense is the best way to do that is to harness technology to create a collective form of cognition. What that looks like remains to be seen, but I am aware of people through the Consciousness Hacking community working on building tools that will allow for a collective intelligence mediated through technology. Here’s one example of how this might work in practice. More on this intervention at a later date. I’ve felt the depths of disempowerment over recent months when contemplating the issues at hand. What on earth, can I as an individual, do to help solve this mess? I want a magic button to rally the troops, to galvanise the collective, but it just doesn’t work that way. We must begin with what we can control. We must start looking into our own consciousness, our own patterns, trauma and habits, and transform how we show up day-to-day. The more centred, resilient and emotionally aware we are as individuals, the greater the chances that we’ll be able to navigate and lead in these rough times. If only 100 people reading this decided to embark upon a self-awareness journey, and committed to reaching out to 10 different people per day with love, compassion and truth, that’s 1000 people per day we’d be reaching, 7000 per week, 364,000 over the next year. It’s impossible to quantify the impact of us showing up from our deepest self. But this is the one variable we have control over. Self-awareness is key. Developing self awareness allows us to develop a more objective viewpoint of reality, which allows for responsiveness rather than reactivity to our external environments. We get less caught in the drama of life and begin to develop a sense of clarity. Self awareness trains us to zoom out from situations, which helps us see things from a more meta, and thus systems level. And cultivating self awareness brings with it the development of presence, and from presence, the highest forms of human emotion arise. Another key factor that must be cultivated is embodiment. We have become habituated to a world that is reliant upon models of prediction and control. Consequently, we live in a society of abstraction, assuming we can think and predict our way out of dire situations. This has worked until recently, but in a time of unprecedented complexity and collapse, we must get back to the most existentially-sound feedback mechanism we have — the body. By harnessing our felt sense in conjunction with our minds, we become more adaptable to our environment. We flow with the currents of change rather than swim against them. One could say we harness ‘feminine’ energy. Fixed mental models won’t cut it in a constantly adapting world — we must cultivate the intelligence that we neglect as organisms, which is the body. Furthermore, the body acts as the closest link we have to nature. In a time of ecological collapse, is it any surprise that we are feeling depressed and anxious? We are organisms in the midst of habitat degradation. The body is our way of feeling into this, and so our disembodied culture that puts mind over heart neglects a vital feedback mechanism, as the international teacher and workshop leader Mike Lousada points out in this article. Of course there’s the temptation to self-maximise in times of trouble. How can I profit from this? What cryptocurrency is a good hedge? These are valid concerns, but they get away from the deeper ones, which is to cultivate selves to show up as leaders in these times. Note: I am working on a more thorough account of what we can do on an individual level to empower ourselves, hack consciousness and build sovereignty in times of change. If you don’t fancy waiting, check out Jordan Greenhall’s perspective. Slow down current system demise: Protests again pipelines, take a stand against ecologically unsound structures, changing your diet. These actions could buy us some time and are absolutely necessary, though may feel futile. Build new systems: blockchain, sustainable food systems, community housing. There are countless career opportunities in these spaces, and they will grow bigger and bigger over the next few years. Shift consciousness: inspire others around you to shift mindsets. Host meet-ups to talk about this stuff. Conduct meditation circles with your friends. Buy wisdom books for people in your work. I briefly alluded to the paradox in the introduction that technology has both the capacity to destroy us and to save us. There is a growing movement called Consciousness Hacking which plays upon Macy’s third dimension, shifting consciousness. We must direct capital resources towards technologies that are scalable, cheap and promote human connection, empathy and love. If you’re interested, check out Transformative Technology and Consciousness Hacking. That said, I don’t believe rational discussion is the best way to influence others to wake up. People’s habits are too ingrained with the status quo. Emotion needs to be involved in belief change, and so vehicles of art are going to be essential for transformation. Think how successful Planet Earth is in terms of guiding behaviour change versus a plain Scientific American article. So we need more artists. You might be asking yourself, why isn’t this topic part of the main political discussion? Why aren’t world leaders talking about these things? Well, many leading thinkers are, we just don’t hear about them in the mainstream. We are so caught up in the (very entertaining) theatre of politics rather than the structures it purports to represent. Moreover, the incentive system is misaligned. Political office is 4–5 years for most elected representatives in Western democracies, so concerns that temporally exceed that range are always going to be strategically subservient, from a re-election perspective, to more pressing ones. What’s more, politicians are so often trained in the reductive school of industrial consciousness that got us into this mess in the first place, and so don’t think on a systems-level. Why I might be wrong? Enlightenment thinkers tend to claim that we escaped this vicious cycle when we began to harness the power of rationality. Indeed, techno-optimists think we’ll be able to develop the right form of benevolent artificial intelligence before it’s too late, and AI might erase the gap between complexity and competence. The Singularity, an event which would see us merge with machines to become superhuman cyborgs, could theoretically beget that possibility, as our cognitive capacities would be exponentially enhanced so we could better sense-make of the world. This is definitely feasible, but its success depends a) on timing b) on whether such resources are purely for the elite or are universally accessible and c) assumes AI will keep us around and allow us to continue to be the carriers of consciousness. There are also the array of geoengineering tools that are being created that could in theory reverse some of the climate damage we’ve caused (see this recent development). Note this latter point is pretty much what the entirety of the scientific community is reliant upon. Then there’s the narrative being propagated by Harvard psychologist Steven Pinker, who in his book Enlightenment Now, shows through hundreds of empirically-sound data points that the world has never been better. Pinker suggests our natural tendency towards doom and gloom is an evolutionary survival mechanism and that the internet has given us immediate access to negative news so that it feels like things are worse than they actually are. This negativity bias is definitely a potential blindspot, and one I am constantly checking myself for. Marian Tupy from The Conservative think-tank, The Cato Institute, makes this point well in this article, arguing that our tendency to focus on bad news is due to a host of ineluctable psychological phenomena. Matt Ridley, author of the Rational Optimist, makes similar arguments. These are valid points, and in a host of ways — poverty, housing, health, safety — the world is getting better. Yet these dispositions ignore the underbelly, the subterranean variables that are more important to how healthy a society actually is. How fulfilled do we feel? How connected are we to community? How are we dealing with existential risks? How much trust is in the system? What is our relationship to the natural environment? How much inequality is there in society? Fundamentally, in the aforementioned analyses, interiority is being neglected in favour of more tangible variables. But we are social beings. An increasing median income means jack all if it is pitiful relative to others’. Moreover, as Charles Eisenstein says, “our metrics for progress encode hidden biases and neglect what won’t fit comfortably into the worldview of those who devise them.” Pinker et al take a reductive, ex-post approach to data and omits variables that could give us more accurate indications of what is actually going on in the undercurrents of society. So I concur — the world has been getting better in countless ways for the last several decades. Progress is slow, and those on the Left who criticise capitalism ignore the massive gains in health and poverty throughout the world since the globalisation of free markets. I have a Tai Chi teacher who tells a story about his uncle, who was a prisoner under the Maoist regime in China for 15 years. Daily, he’d receive a propaganda newsletter through the bars of his cell. 12 years in, he noticed the propaganda was becoming more and more extreme, and with every extra level of extremity, he would smile. The more severe the narrative got, the more he would relax. Why? He knew from his study of Taoist wisdom that this pull towards polarity meant the regime was coming to an end, and he would be free again. In Taoism, Yin and Yang are seen as two fundamental flows of nature. It’s simple order and chaos. The nature of this duality is nothing can exist in the version of its extreme without a corresponding enhancement of its polarity. Put differently, the further the pendulum swings to the right, the further it will swing back left. Many authors speak about this ebb and flow of progress. The German philosopher Hegel famously described his dialectic in The Phenomenology of Spirit, which shows that a thesis is followed by an antithesis, which is followed by a synthesis. That is, an argument is made, then refuted, and its synthesis is able to transcend each argument’s problems while maintaining the positive elements of both. Cultural evolution can be seen in the same regard (for more on this, I highly recommend reading into 2nd tier integral consciousness or Spiral Dynamics). So how long do we have until the descent into chaos? That depends on who you listen to. Over the last year, I’ve heard from respected systems theorists, environmental experts, AI researchers and thought leaders while out here in San Francisco and Silicon Valley. I’ve also had the chance to sit down and interview thinkers well versed in the space, people like Dr Meg Wheatley and Dr Nathan Walworth. Until the start of the cascading effects, I’ve heard everything from 2 years to 20. Moreover, what even is collapse? Tainter describes it as simply a regression to more simple forms of complexity within a system. My honest answer is that I don’t know what it would look like: there has never been a systems collapse on the level of the entire globe before, so this is an unprecedented moment. Moreover, it depends on how we show up as individuals and as a collective — will we regress to selfish, primal behaviors or step up and into ways of being and doing that emphasise the needs of the collective? This is an extraordinary time of potential. Systems demise will hurt in the short run — and really hurt at that, especially the world’s most vulnerable — but would ultimately allow us to co-create more conscious, life-enhancing systems that are constructed with planet and people in mind, not just profit. These systems are being devised all over the world as I write this — from blockchain to circular economies to self-sustaining communities — ready to emerge en masse when called forth. These paradigms must be built on the periphery. There are too many vested interests, at play, too much concentrated power, too much structural inertia, for us to sufficiently affect incumbent systems and institutions. They must die under their own distortions. And we must build parallel systems by their side, so when the time is right, people can migrate into better ones. Systems that do not reduce us to mere automatons working mindless jobs at the expense of wellbeing. Systems that allow us to explore our creativity, not block it. Systems that are fairer, free from corruption and in line with higher values. Systems that synthesise the best of Left and Right thinking. Systems that allow for the blossoming of other life forms. And what a test for our humanity in the short run. How will we lead? How will we show up? From fear or from love? From selfishness or from altruism? Order is ending. Chaos is beginning. Can we dance in destruction? Writer and organisational behaviour expert. Focuses on systems thinking, chaos theory, leadership and the learning organisation. Scholar of Buddhism, general systems theory, and deep ecology. Renowned voice in the movements for peace, justice, and ecology. Founder of the Work That Reconnects. Science-backed meditation course quantifying states of awakening and peace. Highly recommend.